The story is that years ago, in our life back in New Hampshire, we had purchased a large oil painting by a Massachusetts realist painter named Randall Deihl. For a decade, “Big Cowgirl” hung on the wall of our high-ceilinged condominium in Keene, reminding us of all things about the west that we loved. There were lots of stories about the painting that had developed over time, but what we did know is that it was painted when the artist lived in Santa Fe in the 1990s, because he was inspired by a mural on a building in Las Vegas, New Mexico and we were on a quest to see if we could locate it. 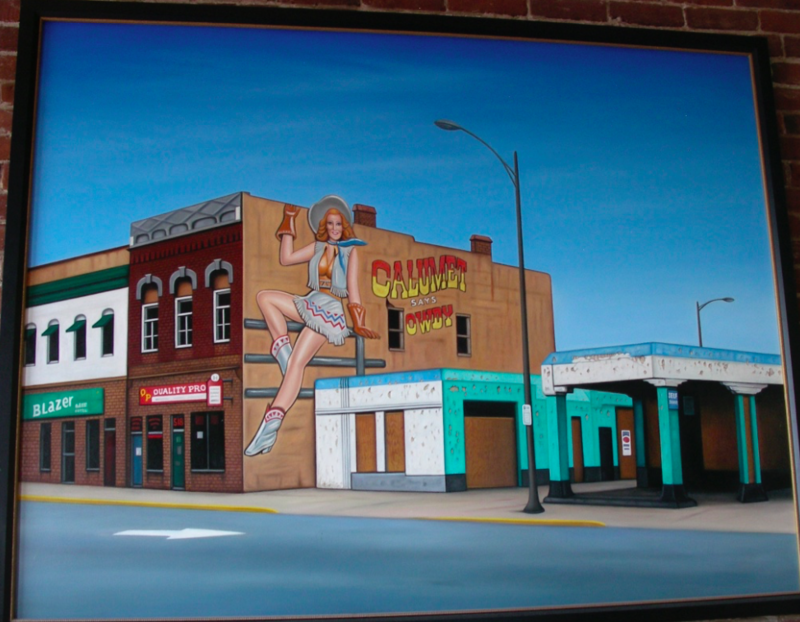 The Calumet mural on the building in downtown Las Vegas. This inspired the “Big Cowgirl” painting by Randall Deihl. 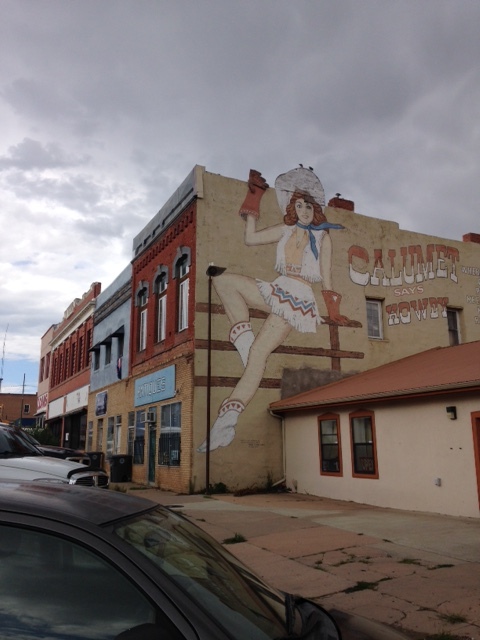 We learned that the building mural was created for the 1984 movie, Red Dawn, which was set in the fictitious town of Calumet, Colorado, which explains why the mural (and the painting) reads, “Calumet Say Howdy”. The film was partially shot in Las Vegas, New Mexico. That much we had learned along the way when “Big Cowgirl” lived in our home. When we dramatically changed our lives in 2014, selling most of our artwork and possessions to live on the road, “Big Cowgirl” was donated to lthe Gilcrease Museum in Tulsa, Oklahoma. Their collection of contemporary Western Art was part of the inspiration to send her there, hoping she would enrich the visitor experience. We felt that finding the actual mural that inspired Deihl would bring a close to our history with “Big Cowgirl”. It wasn’t hard to find the mural when we got to town, near the intersection of Grand Avenue and Lincoln Street. The years haven’t been kind to the mural, but that happens when certain parts of town begin to loose their luster. 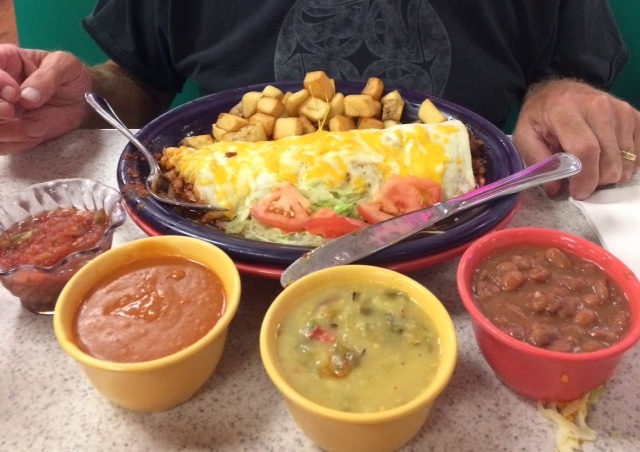 Great New Mexico cooking at Charlie’s in Las Vegas. We paid our respects to our Cowgirl and then set out for the local historical museum. After finishing our tour we got a recommendation for the best place to eat authentic New Mexican cooking. 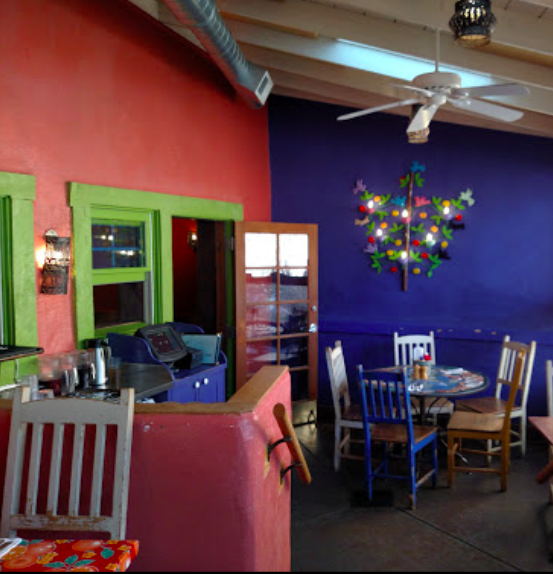 The place is called Charlie’s and the food was simply unforgettable with burritos and flautas served on just-made flour tortillas and topped with the freshest of green and red chile. Peter enjoyed his burrito and I savored every tasty bite of my chicken flautas with black beans and more chile sauce. Wow. 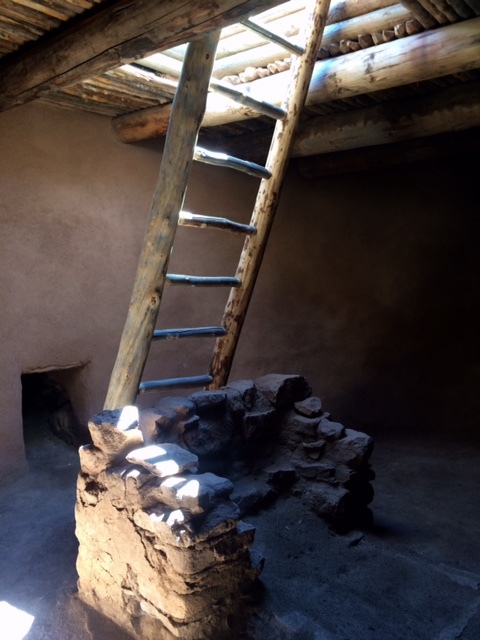 The kiva at Pecos Pueblo. 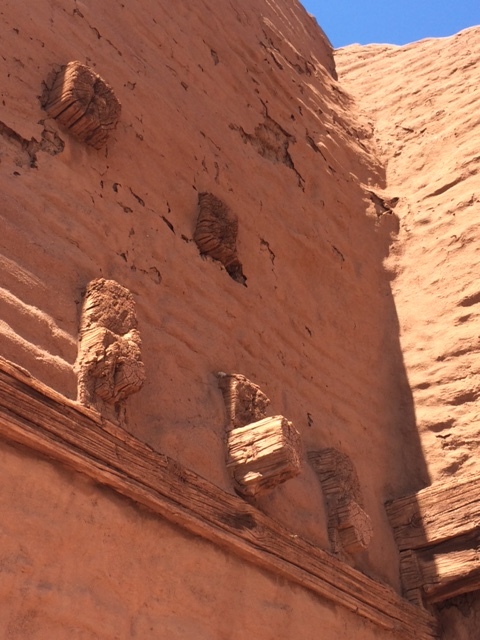 Our excursion to Las Vegas included a return to Pecos Pueblo, a ruin that we had visited in 1992. The historically accurate name is Cicuique Pueblo and this site is significant for a few reasons, not the least is that it was first studied in the early 1900s by Alfred V. Kidder, considered the foremost archeologist of the Southwest. That careful study is the reason we know as much as we do today about these people who lived in this valley for hundreds of years before the arrival of the Spanish in 1541. This was a very successful, well-fortified, and wealthy pueblo whose trade reputation was enhanced by their location in the valley of the Glorieta Pass through the Sangre de Cristo Mountains connecting the Rio Grande Valley with Great Plains. At its peak, about 2,000 people were estimated to live there and ancestral farming practices provided sustenance. When the Spanish arrived, everything changed. In 1610, the early Franciscans tried to convert the people who resented the imposition of the invaders’ religion and the destruction of their sacred kivas and the banning of their ceremonies. There were three mission churches built here on the same foundation: the first in 1621, the second 1677 and the third in 1717. The pueblo participated of the Pueblo Revolt of 1680 which did temporarily drive out the Spanish oppressors. Ruins of the 1717 church and Pecos Pueblo. In addition to suffering through the Spanish oppressions, there were raids by Navajo and Apaches, and later Comanches. Peace and prosperity did not ever return to the pueblo and even when the Spanish returned with a more conciliatory mindset, the population did not recover. After a slow decline, the final group of residents left the pueblo in 1838 and joined their linguistic cousins at Jemez Pueblo. The skeleton of the last church still stands and here we were able to pay our respects and sit in the warm sunshine for a short time, imagining the lives and stories and humanity these walls hold, grateful for the careful attention to the care and upkeep of these fragile structures. Harry’s Roadhouse in Santa Fe. This photo is courtesy of their website. After a couple of days, we moved down the valley, returning to one of our all-time favorite campsites at Cochiti Lake. Situated about 30 minutes from Santa Fe and 45 from Albuquerque, it is isolated, quiet and remarkably beautiful. We met up with some Airstream friends for lunch at Harry’s Roadhouse in Santa Fe, a fun, quirky and delightful place with a spectacular outdoor patio tucked under shade trees and pinon pines that is completely engaging with its rustic, southwest style furniture and colorful table coverings. We watched the full moon rise one magnificent night, sitting outside until its reflection became visible in the lake waters below. Peter cooked up some amazing bison burgers one afternoon and we relished the abundant harvest of avocados and green and red chile available here in New Mexico which make those burgers exceptional. Sanctuario de Chimayo on a late summer day. One late summer afternoon, we took a drive to the countryside and caught the incredible beauty of the long shadows on the hills and mesas up east of here in Chimayo. No trip to New Mexico would be the same for us without the pilgrimage to the little Sanctuario de Chimayo, an adobe church built in the early 1800s by an early Spanish land owner who was a devoted follower of a pilgrimage site in Guatemala where the clay is known to heal. 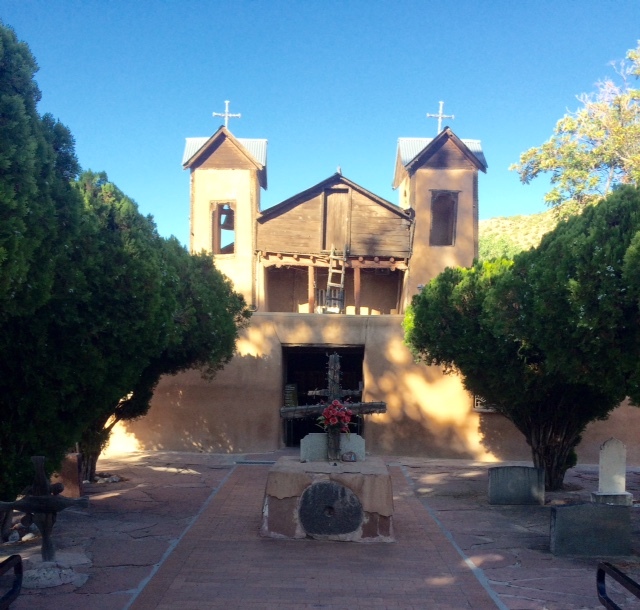 Soon, the red dirt of Chimayo became known for its healing and the lovely chapel, now owned by the Archdiocese of Santa Fe, is a well-established site for visitors around the world. The lovely handprinted wooden altar is remarkable, and no photos are permitted in the Sanctuario so you will have to come see it for yourself. 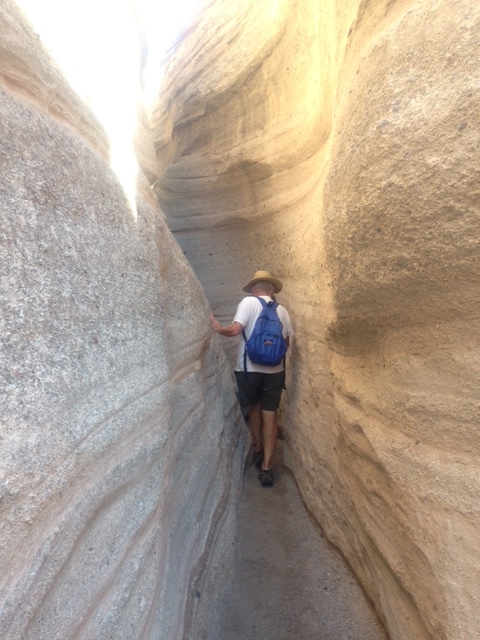 Peter navigates the slot canyon at Kasha-Katuwe. We hiked in Kasha-Katuwe Tent Rocks National Monument where the slot canyon presented some challenges for us. The early morning cool breezes made the three-hour hike much more tolerable for us and we would highly recommend it with the disclaimer that the last 1/8 mile is very challenging with rocks and crawl techniques that kept us from the final ascent. Nonetheless, it was wonderful. Our next hike in Petroglyphs National Monument in Albuquerque was on our bucket list since our first trip here thirty years ago. The story of the preservation of the 14-mile volcanic escarpment is nothing short of miraculous in light of the rapid growth in the city. In five short years, the public coalition of landowners, Pueblo people, conservationists and philanthropists put together the Petroglyph National Monument which protects one of the largest petroglyph sites in North America, roughly 25,000, featuring designs and symbols carved onto volcanic rocks by Native Americans and Spanish settlers 400 to 700 years ago. 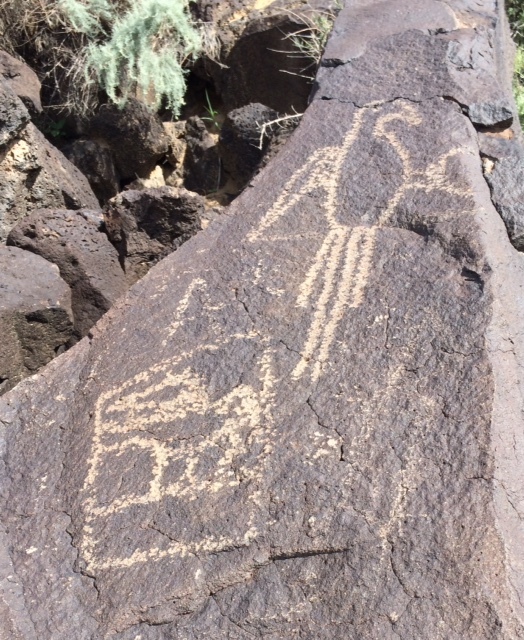 Maccaw petroglyph on the walking trail of the same name at Petroglyph National Monument. We wrapped up our time in the Land of Enchantment with a week in Albuquerque at a retreat which fed our hearts and our souls as we heard from inspirational teachers Fr. Richard Rohr, Mirabai Starr, Barbara Brown Taylor, Brian McLaren, and Barbara Hughes. In an example of great synchronicity, while at the retreat we met people from two places that hold a precious place in our New Mexico memories – Tesuque, where we came on our wedding trip thirty years ago; and Silver City, the place that keeps showing up on our short list of places for a stay of several months. We’ve left with our hearts full with possibilities and hope. 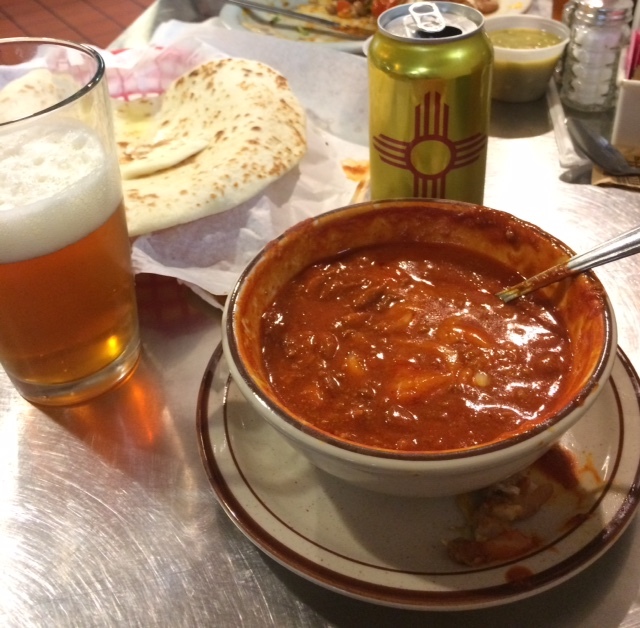 At Duran’s Pharmacy, chili, fresh tortilla and Happy Camper, one of my favorite IPAs from Santa Fe Brewery. We couldn’t leave Albuquerque without a visit to the Rio Grande River on a lovely, hot, summery afternoon. Another tradition added to our periodic visits to New Mexico, which will hopefully be more frequent in the coming years on the road. We now head north to our beloved Wyoming and an extended visit to the Grand Tetons which includes our reunion time with old and dear friends at the Triangle X Ranch in Moose. Who knows what other remarkable adventures await us in this pilgrimage that is our lives. We invite you to come on along with us. We’re grateful for your companionship. Liz and Peter continue their travels in their Airstream, on the way to Wyoming. This entry was posted in Uncategorized and tagged Airstream, Charlies Las Vegas, Durans Pharmacy by lizbrown489. Bookmark the permalink. I enjoyed traveling along with you and look forward to your forthcoming adventure in Wyoming. Incidentally what state are you guys registered to vote in? I’m hopeful as many as possible. You probably saw that Molly Kelly got the Democratic primary vote for the N.H. governorship. She’s the mother of one of Meredith’s Keene classmates. Really loved this post you crazy kids. Food, history, folk and hiking, what’s not to love!! What an amazing journey! I’m traveling & learning right beside you virtually. Your affinity for this beautiful and historic region is evident. Continued safe travels.